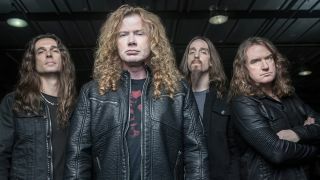 Megadeth are currently in the process of recording the follow-up to 2016’s Dystopia – and it’s expected to be released in the coming months. Now, in a new interview with Kerrang, Mustaine says the band are “trying to keep with that real heavy thing” and also reveals what his son thinks of the record. Mustaine adds: “Dystopia was more of us doing what makes us feel good – there’s a lot of super heavy, fast drumming at the end of some songs. “My son was in here two days ago and when we were doing Dystopia, he was listening to the songs and making comments. The ones he commented on were the ones that got the best response. Last week, Megadeth released a trailer for their upcoming anthology Warheads On Foreheads, which will launch on March 22 via UMC.